Get Krafty with Tiddly Inks!!! Thank You so much for stopping by today! Visitors are the best! "Building Queen Wryn" is a relatively new digital image from Tiddly Inks! She is so adorable with her building gear! I don't know about you but I feel comfortable in a tool belt with some power tools! *drill drill! * What could Wryn be building? A tree house, an abstract sculpture or perhaps a brighter future for all of us? I think "Yes, yes and YES!" Build all of it Wryn! Build it all! I wish you a day full of giving and receiving love and the confidence to create the day of your dreams! If so inclined, please join us in the Tiddly Ink's Challenge Blog! 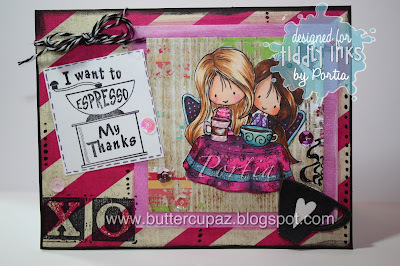 Our current challenge is to create a new make using a Tiddly Image and kraft paper!!! Fun City! A Very Tiddly Inks Thank You!!! Hello Lovely People of the Universe! Welcome to today's post which is an Anything Goes make using a fabulous Tiddly Inks' image!!! In every moment, we can choose gratitude. I made this card to represent my gratitude for a friend's birthday gift. I am at an age where birthday gifts are not quite required. In other words, I am not five nor am I twenty one. I am a combination of the two and then some! ;) If a friend thinks of me enough to purchase a gift for my birthday, this is MAJOR! So major, that I just may make a handmade "thank you" card for such an event! Please know that you are WELOME to JOIN in the Challenge fun at the Tiddly Inks Challenge Blog HERE! Please Don't Be Square Challenge! Please feel free to join in the Tiddly Ink's Challenge this week which is to create any project using a Tiddly Image in the theme of non-squares! On other words, this week we are encouraged to avoid the traditional square shape in your paper crafting endeavors. Try out a new-to-you shape and please share your tiddly makes with us!!! Feel free to join in this challenge here! 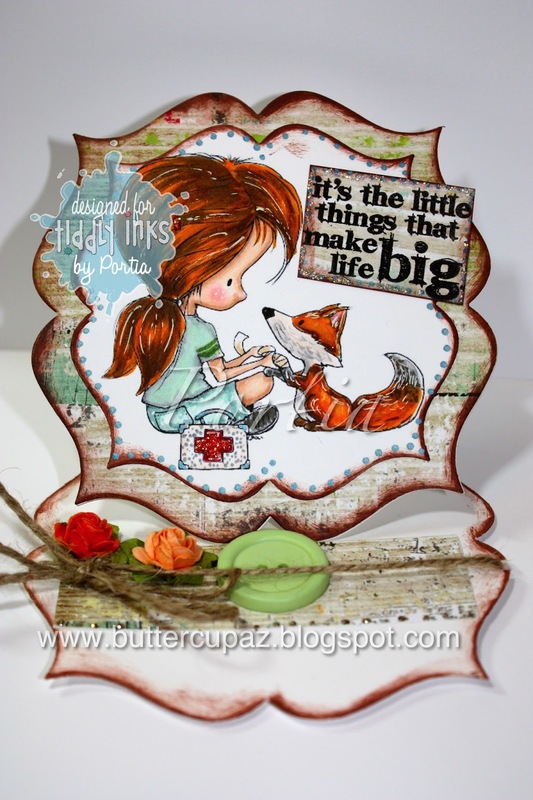 For this challenge, used a super cute digi from the Sugar and Spice collection! See my materials below for the link! Thank You so much for stopping by!!! Enjoy the beauty of your day! My Mom is a helper. I have been driving in my little honda civic with her when she notices a lady slip on a puddle on the sidewalk and to the side of the road we pull over, so she can be an angel to this lady in need who is temporarily paralyzed, her arm broken behind her back, her body contorted as we wait and give her shade in the hot Arizona sun, for the professionals to arrive. It amazes me how some people just stand around and watch a person in need. We all react differently in distress. Some freeze. Because I was raised by a woman who knows not the word "freeze" but instead lives a life of "I must help now", that's what I saw growing up, so that's what I do, and I am also grateful for others who do so too. Hold someone's hand. Ask them their name. Make small talk. All of these little tiny acts help hearts in big, huge ways when someone is in pain, visible or otherwise. Whether you are the wounded fox or the Foxer Upper, I hope you know that you are loved, and are helping others just by being you! Woo-hoo!! !